Growing up in St. Johns was such a blessing to me. I grew up in a neighborhood where all of the parents were referred to as aunt and uncle. Up the hill lived aunt LaKay and uncle Joey. Across the street were aunt Karen and uncle Kelly as well as aunt Julie and uncle Ted. Somehow, I knew that these individuals loved me for who I was in spite of me being such a knucklehead. The old saying, "It takes a village to raise a child," definitely applied to me. Much of who I am today was because of the surroundings and the people that helped me in my life. I will always be eternally grateful to them. I have fond memories of places around town. I enjoyed the meadows, chunkies bump, screamers valley, three ponds, snake hill, lovers’ lane (although I never used it, and that's my story and I'm sticking to it) and the most loved of all, the drain. The drain was actually considered a swamp. I never considered it a swamp, though. To me, it was a Garden of Eden. I lived in that drain fishing for minnows, trapping muskrats or riding the waves when it was monsoon season and flooding was at its best. I always made things to do when there was nothing to do. 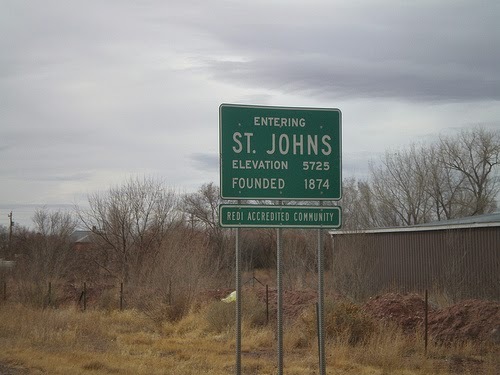 I, along with my wife Karen, have raised our family here in St. Johns. She actually grew up in San Diego so living here is quite a different environment in every way possible. She misses the ocean and family; however, we both feel the same way about our little town. We have had a village to raise our children and that turns St. Johns into a Garden of Eden for us. We have had people watch out for our children. They have had great leaders, friends, and role models. They have participated in a never-ending list of activities and testimony-building experiences. They often had dirt under their fingernails as they learned how to work hard, and they have had many opportunities to serve. Wherever you live, a place is what you make it and what you put into it. You can see just an old swamp, or you can see a Garden of Eden. Is it just a dirty little Eastern Arizona town, or is it paradise? I personally believe it is paradise, and I wouldn't change it for the world. Thank you, St. Johns, for helping me to understand who I am, for helping me to raise my family, for helping me to learn who God is and His son, Jesus Christ. And thanks for all of the memories, all of the little things that make life so great.